The Stanley Picker Gallery has now kicked-off its No Competition! 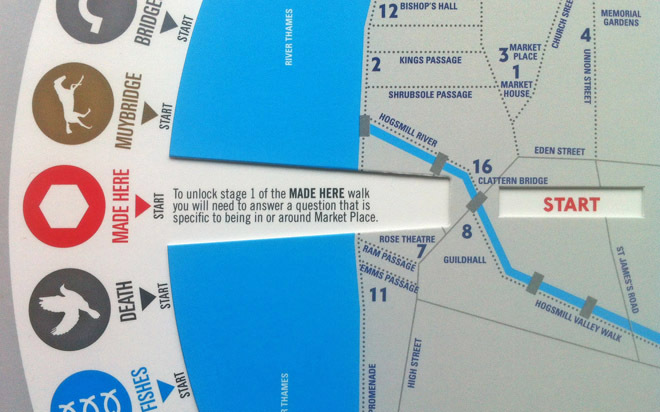 programme – taking place off-site whilst the venue itself is closed for refurbishments – with the Kingston Navigation Wheel, a special revolving cardboard disc that maps five new cultural walking trails around Kingston on the themes of Bridges, Death, Muybridge, 3 Fishes and Made Here. Throughout May and June the Kingston Navigation Wheel’s creator Paul Farrington of Studio Tonne is leading special walking trails around the town, following the routes on the Wheel itself, with residents and Kingston visitors already finding many new and unusual features about the town, including viewing the site of the original wooden bridge across the Thames and discovering a small museum hidden within a funeral parlour! Free copies of the Kingston Navigation Wheel are also available from The Market House, The Rose Theatre, Kingston Museum or Kingston University’s Knights Park Campus Reception. Kingston Navigation Wheel forms part of No Competition! a programme of free off-site events exploring the relationship between art and non-competitive sport, with new commissions by Paul Farrington, Ian Whittlesea and Charlie Murphy staged at sites in Kingston, in central London and online whilst the venue itself is closed for refurbishments.